Being asked to be in a bridal party is a huge honor and one that you probably don’t want to have to turn down because you can’t afford it. Here are five ways you, too, can accept a bridal party invitation without having to stress out over the cost. 1. 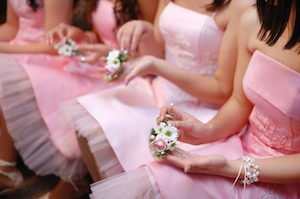 Trim expenses on your hair, makeup, nails and outfit if you’re asked to be a bridesmaid. Check whether anyone you know is skilled with hair or makeup and if so, ask him or her to do it for you. Another option is to have a professional do either your hair or makeup and do the other one yourself. Also, skip the pricey mani and pedis — DIY them! For your bridesmaid dress, offer to assist the bride in picking one she likes but that is also affordable for you. Help the bride put together a style board beforehand so you’ll know her tastes and can do some of the research ahead of time. Plan bridal dress shopping days around upcoming sales for major retailers, so you’ll have more affordable options to choose from. Once you’ve bought the bridesmaid dress, bring it to a trusted tailor who won’t overcharge you for alterations. Chances are you won’t be wearing it much after the wedding, so don’t splurge on getting it fitted at the dress shop. If you’re going to be a groomsman, save money on your clothing by wearing a suit you already own — or if you must don black tie, search for a good price on renting a tux. 2. Get involved with the bachelorette or bachelor party planning so you can have a say in how much it ends up costing. You might think this is aggressive, but Gail Blachly, another Nerd, says addressing expenses head-on can be beneficial. 3. Make a gift plan. If you feel comfortable splitting bridal shower or bachelorette/bachelor party presents with the rest of the wedding party, do so. If not, aim to spend 20% of your gift budget on the shower, 20% on the bachelorette/bachelor and 60% on the wedding. 4. Use your credit card rewards or loyalty program points to help cover travel and lodging costs. Since it can take some time to earn enough points, start saving as soon as possible. 5. Set a savings goal and work to meet it. As soon as you agree to be in the bridal party, talk with the bride or groom to estimate how much it’ll cost you and use that as your savings goal. 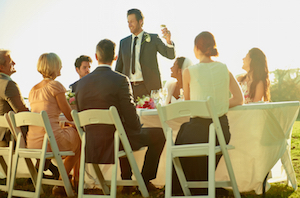 You might think you can’t afford to be a bridesmaid or groomsman, but don’t say no right away. With a little planning and resourcefulness, you can afford more than you realize. The next time you’re asked to join a bridal party, follow these suggestions so the experience leaves you with fond memories and sound finances.